Location: Featured in National Geographic as one of the most unique spots in North America, Point Roberts, Washington, USA – is only 35 minutes from Downtown Vancouver, Canada home of the 2010 Winter Olympics and 40 minutes from Bellingham Washington, this unique location puts you on a classic NW beach in the USA. Accommodations: FULLY FURNISHED, GORGEOUS, DESIGNER HOME, 3 BEDROOMS (2 OCEAN FRONT), 2 BATHS (SLEEPS 6) EXCEPTIONAL SOUTH-FACING, BEACH-FRONT HOME, Granite and hardwoods throughout this designer quality home has breathtaking views from the snowy peaks of Mount Baker, across pristine straights to the San Juan and Gulf Islands. Private beach, walking distance to Light house Park, Point Roberts Marina, Point Roberts Air Field, dinning and shopping. One of the most unique spots in all of North America, Point Roberts, Washington is a 5 square mile Peninsula of land owned by the US but located just below Vancouver BC Canada. Surrounded by clear island waters those who live in this “national point of interest” believe we have it all. In just 20 short minutes you’re at the gateway to one of the most beautiful and metropolitan cities in world Vancouver, BC, and just a quick trip to the traditional North West beauty of Bellingham Washington. BY CAR - An interesting point about the Point is that the only way into Point Roberts from the US mainland is by water or air. Visitors by car will need to take a short detour through Canada. 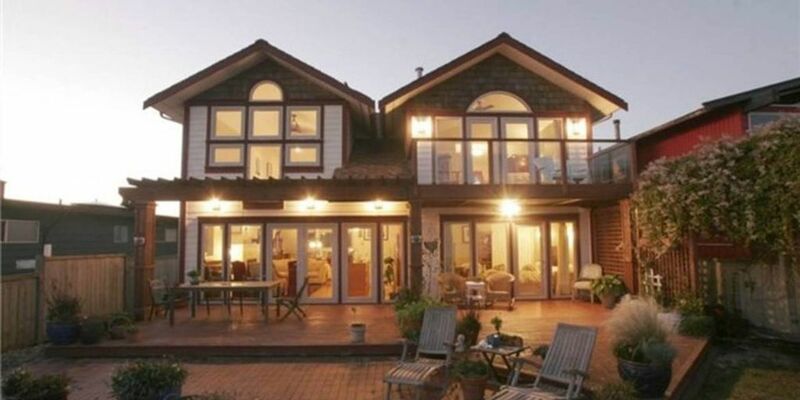 BEACH FRONT LOCATION, Stunning views from Mount Baker in the East to the San Juan and Gulf Islands to the West. This south facing beach front home lets you wake to beautiful sunrises and toast the magnificent colors as the sun sets over the Georgia Straight and falls behind the Gulf Islands. In the summer months you can watch the pods of Orcas pass by just off shore. Year round wildlife abounds with golden and bald eagles, blue herons, seals, sea lions and dolphin. This home is conveniently located just a short walk from Point Roberts Marina, a premier recreational marina for all your nautical needs. When visiting don’t forget your clubs, you will not want to miss a round or two at the Point Roberts Golf and Country Club one of the finest courses in the Pacific Northwest. Graham Cooke and Wayne Carleton have designed a course that flows through the land while taking care not to disturb the natural beauty and wildlife. If you are after even more active pursuits you can, hike, bike, kayak or even fish from the beach or excursion to any Gulf or San Juan Islands. You will always remember your stay in this beautiful home one of the North West’s most beautiful beaches in one of the most unique places in North America. LOG ON full high speed wireless internet service. The house has 2 separate decks for entertaining. You can barbeque and enjoy the beautiful yard and summer garden, just off your private beach while taking in soul filling views. There is just nothing like a glass of wine as you and your guests watch pods of Orcas jump and play just yards away. The Orcas arrive in the area in late spring and stay throughout the summer, there are sightings almost daily. This fully furnished designer home has 3 bedrooms each equipped with a TV, the 2 bathrooms each have luxurious Jacuzzi tubs. The living room features a great gas fireplace surrounded by comfortable sofas and chairs, a TV, stereo, cable and entertainment system. The living room opens with double French doors to the oceanfront deck. The large dining room has seating for 10 people. PETS: Damage deposit may be required. ACTIVITIES: Beautiful 18 hole golf course-Point Roberts Golf Course, with a driving range; walking along the beach or the many beautiful trails through the beautiful forests (Lilly Point). Kayaking (either bring your own or rent them at the county park only a short walk away) Boating and fishing, the marina is only a 5 minute walk away, biking, whale watching among other wildlife. Swimming, but beware the water can be a bit cold, Beach Barbeque. Point Roberts was the perfect location--a USA address just 35 minutes from YVR, 40 minutes to my downtown Vancouver office, a pleasant 2.5 hour drive to skiing and summer fun in Whistler, all the while providing gorgeous ocean, island and mountain views, peace and quiet, magnificent old growth trees, wildlife. Gracious, generous decks for sunbathing or shady spots for stretching out with a great book. The house is approximately 40 minutes from downtown Vancouver. Tsawwassen town is ten minutes away. A quaint town with lot's of restaurants, coffee shops, shopping and an outlet mall is 15 minutes away. Vancouver Island and San Juan Islands. The BC Ferries Tsawwassen Terminal is just 10 minutes away to Victoria, Nanaimo, and Swartz Bay. Pods of Orca and Gray Whales are commonly sited from the deck as well as seals and sea lions. Bald Eagles, cormorants and other water fowl populate the Point. The sun rises over Mount Baker and sets over Vancouver Island. Glorious sky vistas, romantic moonlit waves crashing on the shoreline. Stroll the sandy beach at low tides or scavenge for drift wood and shells. Enjoy a glass of wine on the deck at sunset and have s'mores around your beach fire with the family. Well appointed with interesting decor and very comfortable. Would highly recommend. We had a great time at this Point Roberts home. It was clean and well stocked. It is furnished with gorgeous antiques and has comfortable beds. We really enjoyed the jetted tubs and the view from the back deck. We made friends with the neighbors and took time to explore the entire peninsula, Point Roberts is a really interesting place! Thanks so much for sharing your home with us! We had a wonderful family vacation at this waterfront home. The house is very clean and almost every room has a beautiful ocean view. The sunsets were lovely and we enjoyed seeing seals, bald eagles and even orcas from our patio! It was great being able to walk out of the home and directly onto a lovely, uncrowded beach. We enjoyed hikes in Canada which was only a short driving distance away, the border crossing was never a long wait. We hope to be back again next summer! "Linda and her beautiful family were delightful guests...helpful, cooperative, and considerate of both the property and the neighbors. I would welcome their visit in my home anytime." Point Roberts early March visit! We were met there at our leisure the day we arrived, very accommodating to our schedule. House was lovely, older touch with classy furniture throughout but bedding and bathrooms were very up to date. The whole house had a peaceful easy feeling to it. Very, very quiet location, kids played on beach every day, tried to even swim several times making it only to the belly button... Very cold water but we knew that going in! House was very clean and spacious, total relaxing getaway. Super markets in Point Roberts generally lack substance, would suggest shopping in Canada then bringing to house. Looking forward to going back in the summertime!! What a wonderful time, clean home, quiet area, all the nicest details, everything thought of. The whales came by at night as we sat by the water, they were so close we could see and hear them as they passed by in the dark. Again during the day a pod of 12 came by. Adults and babies, jumping out of the water - they put on quite a show. We will definitly return. Incredible!! We stayed at this property the last week of May and found it to be very comfortable, clean and well appointed. Everything one could possibly need was provided and easy to find. The fireplaces were welcome on cooler evenings. The area is wonderfully quiet and has lots of dog walking options. Ocean watching from the deck was exceptional - even better using our binoculars. Normally we don’t return to any vacation rentals but we will definitely return to this property. The house is beautifully furnished and well appointed if you like to cook! Beautiful and picturesque, quaint and quiet, Point Roberts is the perfect get-away. If you crave privacy and anonymity, this is the place to bring your family. Whale and bird watching, golfing, boating, hiking, forest walking, are just outside your door, while shopping, spas, and fine restaurants are only a short drive away. Relax with magnificent views morning, noon, evening and night. Close to ferries, the airport, and downtown Vancouver. Beach fires, barbecues, great place to storm watch in the Winter months!